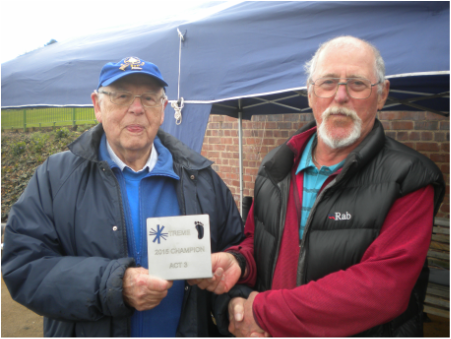 ACT Three took place in the delightful surroundings of Dartmouth Park in the West Midlands courtesy of Sandwell Model Boat Club whose hospitality towards the visiting skippers was second to none. A dozen skippers attended the meeting and despite the light and fluky winds from the Northwest in the morning all the skippers appeared to be enjoying themselves. The wind skipped around to the forecast North Easterly by the afternoon which given the layout of the beautiful Victorian boating lake was a blessed relief to everyone involved especially the course setter. 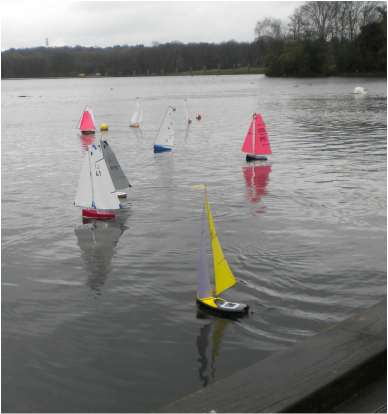 The fleet by this time had split into three groups the Sandwell skippers many of for whom this was their first venture into Footy racing at this level, a mid fleet mainly consisting of Birmingham MYC skippers and then five big hitters who regularly sail in open events. Once the formalities of boat & sail measurement were out the way the racing got underway, and for the top five it was incredibly close with all five skippers recording race wins in the six morning races. When a couple of these guys tripped up Mark Unitt (18, 12"Slim) and John Burgoine (35, 1299) were on hand to pick up the places especially when the wind strengthened in the afternoon. This is probably down to their slightly smaller largest rig. These two are probably the ones to watch out for in future Footy events. Robin Webb (SUI4, Slim) had an eventful day with this Phil Tyler boat, one of those what could go wrong for him did go wrong, however he battled on which is to his credit. The tricky wind conditions meant we weren't able to set a particularly extreme style course and hd to adopt a slightly more pragmatic approach with a more regular upwind/downwind course. After lunch Mike Ewart (36, ICE) put the pedal to the metal and recorded a series of race wins which clinched him race victory by a reasonable margin the other four it was all very close Peter shepherd should have taken second however stupidity came into play and a failed battery when coming second of the final double points race allowed Geoff Raygada (41, Fat Boy slim) to consolidate his second position. It nearly cost Peter more as David Wilkinson (46, Briethorn) sailed a superb race to finish first in that round and Peter Jackson wasn't that far behind in the end these three finished just two points apart. A notable performance from Tony Butler (105, 1299) in race eight with his fourth place, a great achievement considering this was his first Footy event. 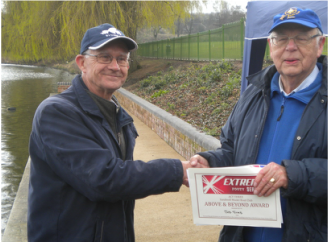 The Above and Beyond award was presented to stalwart of the Midlands Footy scene Sid Sims (05, ICE) and Tony took a special prize for the highest placed Sandwell skipper. I think everyone enjoyed themselves and I know I for one am looking forward to coming back when the Extreme Footy Series returns to the Sandwell venue in September. The next Footy open event is the Videlo Globe Trophy, Sunday 26th April at Frensham Sailing Club and this is followed shortly after by the Extreme Footy Series first visit to Two Islands for ACT4 on Saturday 2nd May 2015.